Recently I learned about the coolest yoga discount ever, that I think outpaces every Living Social or Groupon deal you’ve ever seen. With one of the aforementioned deals, you’re locked into a studio for a (typically) one-month pass. While this is a good deal for some people, you’re locked in to a deal for a month, and if the studio’s schedule doesn’t mesh well with yours, you may not be able to make it to enough classes to make it worth your investment, or you may be stuck in a style that doesn’t make your heart sing. Now, with the Passport to Prana, you can try one class at 25 of Atlanta’s top studios, on a practically unlimited time frame. What’s more is that the deal only costs $30, so with the average yoga class costing $15 (and all the way up to $24 at Exhale MindBody Spa), you can make up for your investment in a mere two classes at most studios. If you could make it to every studio in town, you could wheedle that price per class down to $1.20! This is one of the coolest ways possible to keep your yoga practice fun. If you want to try a new style, but don’t want to commit to $15, you can put down $2 for one class! If you’re looking to rub elbows with a teacher you’ve admired, here’s a chance to get out and do it on the cheap! If you’re curious about a studio that you think does a good job, here’s a prime opportunity to try it out. There are no limits to the classes you can attend, meaning all times, all levels, all classes are open and available to you! 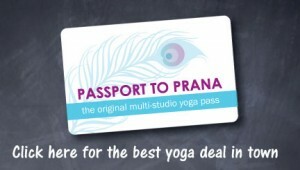 …and a whole lot more that can be found on the Passport to Prana website. I honestly think this is one of the coolest deals around because it follows my mission of helping to keep your yoga practice fun in Atlanta! I love these guys so much that I became part of their affiliate program, so, by supporting Passport to Prana, you’re also supporting Atlanta Yoga Scene! Click on the image below to purchase one of your own.